Seems like "spring forward" comes earlier every year! This year we all need spring to get here as early as possible and one of the first real signs of spring is the changing of the clocks! It is hard to believe it is already March and we are on our way to April! The spring brings many extracurricular activities to our schools as well as professional learning opportunities. The CEC Convention in San Diego April 8-12 is going to be one of the best ever and will offer some new, innovative opportunities you will not want to miss! The CASE events will continue to set a high bar. The Executive Committee meeting will be on Tuesday April 7 right after the Inter Division Caucus meeting and as are all of CASE meetings, it is an open meeting! The member/board of directors meeting will begin with breakfast on Wednesday morning and continue until about 4:00. There will be great updates, in depth discussions and of course, recognition of our award winners! The Show CASE session this year will once again be featuring Julie Weatherly. Our CASE Night is going to be an evening at the world famous San Diego Zoo featuring animals and dinner in the Wild! We are proud to once again offer a panel discussion on "So you want to be a Special Education Director!" If you have teachers attending who want to start on this career path, be sure to encourage them to attend this session! Watch the CASE website for specifics on all these opportunities! Attending this CEC convention will be a treat for teachers and administrators — why not consider bringing a team! Just a few more days left for voting for CASE Secretary! If you were a CASE member as of February, you should have received your electronic ballot for the office of Secretary! Please engage with your organization by taking a few minutes to look at the bios and flyers on Julie Bost (NC) and Laural Jackson (AK) and vote for one of these very competent CASE members as secretary! We really want to see a good turnout for our electronic election. Voting will only be open for one more week so please take your membership in CASE very seriously and vote for one of these candidates! Thank you. 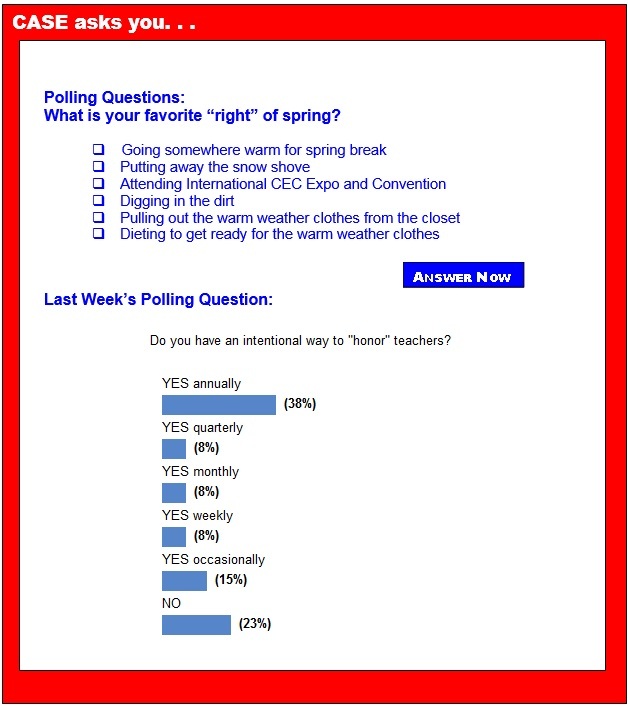 Last Week's Poll was on how often you honor your teachers. I have to say I was totally surprised at the answers! The highest percentage, 38 percent, went to honoring teachers annually but the second highest, 23 percent, went to not honoring teachers at all! Third place, at 15 percent, was occasionally honoring teachers! There was a three-way tie for last place at 8 percent for honoring teachers quarterly, monthly and weekly. We need to have a discussion on creative ways to honor our teachers! Let's post some ideas on the CASE facebook page this week! Or send me a short paragraph on ways to honor teachers and I will put them in our next update! The Centers for Medicare and Medicaid Services wants to hear from NAME members and friends regarding their "Free Care" guidance issued in December 2014. In mid-January 2015, NAME met with CMS. One of the issues discussed was the recent (Dec. 15, 2014) Dear State Medicaid Director letter on the "free care" policy. From this conversation, CMS requested that NAME reach out and gather questions regarding this guidance. Why do we wait for students to fail before we step in? The new alternate assessment—how will curriculum and instruction change? On-Demand Webinar: How do your self-contained classrooms support reading instruction? The National Center on Intensive Intervention is pleased to announce the release of the updated Academic Progress Monitoring Tools Chart! This chart represents the results of the third annual review of academic progress monitoring tools by the Center's Technical Review Committee. The update includes new tools and updated ratings on both the general outcome measure and mastery measure charts. The chart provides ratings on the technical adequacy of commercially available academic progress monitoring tools for mathematics, reading, and writing. These tools can be used as part of a data-based individualization program for educating students with disabilities who require intensive intervention due to persistent learning problems. The tools were rated against standards of general outcome measures or mastery measures. Additional information on how to implement the tools can be found on the chart as well. The NCII publishes this tools chart to assist educators and families in becoming informed consumers who can select progress monitoring tools that best meet their individual needs. Please note that the Center does not endorse or recommend the tools included in the chart. Short on therapists for your school district? EBS provides certified professionals to school districts nationwide: Speech-Language Pathologists, Occupational Therapists, Physical Therapists, School Psychologists, Special Education Teachers, Behavioral Specialists. Contact EBS and ask how we can (1) Save your District Time and Money (2) Support your District Initiatives (3) Manage and Train your Professionals (4) Deliver Customized Solutions. Recently, an expected vote in the House on the Student Success Act, H.R.5 did not occur due to apparent controversy on the provisions in the bill. It is unclear when or if the bill will come back on the floor for a vote. It is not on the House schedule and the House is in recess. In a report released by the Center for Civil Rights Remedies, researchers studied the discipline gap of U.S. students and determined that it is a driving reason as to why we are unable to close the overall achievement gap. The statistical analysis indicated that those districts with the most outstanding suspensions have shown their students to be missing out on days of instruction, therefore leading to overall poor performance in school. The U.S. Department of Education's Office of Postsecondary Education announced the beginning of the 2015 grant competition for the Fulbright-Hays Doctoral Dissertation Research Abroad Grant Program. DDRA provides grants to colleges and universities to fund individual doctoral students who conduct research in other countries, in modern foreign languages and area studies for periods of six to 12 months. Research into speech therapy interventions usually requires trained listeners to evaluate a student's progress by listening to his or her speech and rating the sounds for correctness, but ratings from speech language pathologists can be costly to obtain and take a long time to gather. Enter the world of crowdsourcing. A study published in the January/February edition of the Journal of Communication Disorders finds that the aggregated opinions of nine untrained listeners recruited through a crowdsourcing platform can provide equally valid assessments compared to the averaged results of three trained listeners. The signs of the season tell us that we have surpassed the middle mark of our school year. By now, the goals you set at the beginning of the year are starting to show signs of either being met or needing to be adjusted. You have had time to evaluate your students, and you can plan for how you will spend the time that is left for educational success. At this point of the school year, you really know your students and have built a trust with each of them. You can read your students' body language and their moods. Will gifted education weather the Common Core? According to a study by the Fordham Institute some districts and states believe that the Common Core gives them a reason to forego services for students with gifts and/or talents, equating the standards with advanced education. "The Common Core was really meant to be a floor and not a ceiling," said Jonathan Plucker, a professor of education at the University of Connecticut and an expert in gifted education, who wrote the Fordham paper examining the situation for high-achieving students. In a political embarrassment for Republicans, House GOP leaders abruptly cancelled a vote on a bill to update the George W. Bush-era No Child Left Behind education law after struggling to find support from conservatives. The bill would keep the annual testing requirements on schools but would give more freedom to states and districts to spend federal dollars and identify and fix failing schools. But conservative opponents said it doesn't go far enough to let states and districts set education policy. Such conservative groups as Heritage Action for America and Club for Growth are among the opponents. As the House of Representatives prepared to take up a Republican proposal for the reauthorization of No Child Left Behind, Congress and the White House inched toward a confrontation over the federal role in education. The House is expected to pass a plan this week that would cut back federal regulation of education from kindergarten through 12th grade and give state and local authorities more discretion over everything from assessing teacher and student performance to the flow of Title I money, the largest stream of federal funding for low-income students. In rural Washington state, an occupational therapist might drive three or four hours to see a student — that is, if a district can find one to hire. Last year, an occupational therapist job posting went six months without a single application being submitted to Educational Services District 112, which provides special education services to 28 rural districts across six counties near the Oregon border. And that sent the district's special education director, Michelle Murer, searching to find another way to provide occupational therapies to rural students. She found the answer this past fall, overcoming the difficulty of geography altogether, by using an emerging model known as telepractice, in which students receive services from therapists online. Margaret Skoch of Cleveland felt a jumble of emotions as the day to leave for college neared. She was thrilled to be attending her dream school, Notre Dame University, her mother's alma mater. She was anxious about leaving home. And then there was her mental health. Skoch had been diagnosed with obsessive-compulsive disorder, depression and anxiety in high school. Although she was feeling confident and healthy, she worried her symptoms might return. That worry turned into a full-blown panic attack her first night in her dorm. It was the beginning of a rough few months. Learn how families are helping their students with mental health issues adjust to college life. Tests are harder, students' scores are rising, and yet it doesn't really mean we're evolving into a more intelligent society. A new study published in the journal Intelligence, reveals compounding evidence that students are becoming better at standardized test taking, but not necessarily becoming any smarter. Researchers from King's College London studied 64 years of test scores from 48 countries and found a rise in IQ, but it isn't what it seems. The average intelligence rose 20 IQ points since 1950, which would lead us to believe that means the students of today are smarter than their grandparents once were. Developing countries made far more strides in intellectual improvements, especially in China, India, and the United States, which is a reflection on an increase of classroom time and newer teaching methods. The following Notice of Applications for New Awards; Educational Technology, Media, and Materials for Individuals With Disabilities — Television Access was published in the Federal Register on Wednesday, Jan. 14. Notice inviting applications for new awards for fiscal year (FY) 2015. Catalog of Federal Domestic Assistance (CFDA) Number: 84.327C. Deadline for Transmittal of Applications: March 16. The following Notice of Agency Information Collection Activities; Submission to the Office of Management and Budget for Review and Approval; Comment Request; Annual Report on Appeals Process RSA-722 was published in the Federal Register on Wednesday, Feb. 25. Summary: In accordance with the Paperwork Reduction Act of 1995 (44 U.S.C. chapter 3501 et seq. ), ED is proposing a revision of an existing information collection. Dates: Interested persons are invited to submit comments on or before March 27. The following Notice of Agency Information Collection Activities; Submission to the Office of Management and Budget for Review and Approval; Comment Request; Quarterly Cumulative Caseload Report was published in the Federal Register on Wednesday, Feb. 25.